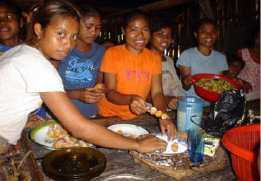 The Food Security Project (FSP) of GTZ worked from 2003-2007 in the eastern part of Timor Leste. The approach presented below was applied during the last two years of the FSP project assignment (2005-2007). The experience of the project with the volunteer approach is described in the following. Establishing a permanent training system in the district for women mobilisers, which includes regular support through meetings, coaching, peer-to-peer support, etc. Developing a pool of trainers with the capacity to provide training (i.e. training of trainers). Establishing a district-wide network of trained community mobilisers. Their exemplary approach forms the basis for disseminating knowledge to other community members. Encouraging greater mutual awareness and sensitivity to problems that community members face. This will enable the mobilisers to be able to address and help in resolving community problems in a friendly and less confrontational manner. Improving the food security of the people living in the targeted and neighbouring districts, thus improving the peoples health and general livelihoods. Improving health, hygiene and sanitation practices in the community. The women community mobilisers are already introducing new ideas and approaches to the community, many of which have led to improvements in the livelihoods of the community. By linking the women mobilisers to a network of external advisors a continuous information and advisory service will be accessible for the women. This is important in ensuring that new ideas are regularly introduced to the communities. Provide information and encourage other women to adopt a more healthy living practice as well as improving the food security at the family level. Foster and promote a non-violent approach to conflict resolution by developing new channels of communication in the village as well as by demonstrating greater mutual awareness and sensitivity to each others problems. Communities in Timor-Leste are often fragile as a result of whole villages being fragmented during the Indonesian occupation. The inner turmoil, constant movement of people in recent history has generated a great deal of mistrust both within and amongst communities. Many communities are in the process of re-forming themselves which includes instilling a sense of community integration. The community spirit is essential as it contributes to individual and social well-being. It helps establish and maintain channels of communication and improves processes for organising resources needed to meet local needs and provide a framework for collective rather than individual action. structively challenge the existing feudal (hierarchical) power system in the communities. The approach gradually alters how priorities are set and how decisions are made in a more transparent and accountable manner. This is seen as being important to avoid conflicts of interests and to resolve differences in an amicable manner. In Timor-Leste, as in most societies, women are the primary care-givers for the family, especially for the young children. They bear the primary responsibility for the health and survival of their children and the whole family. Women make day-to-day decisions about the diet, hygiene, disease prevention and treatment and are responsible for the home garden. The decisions they make depend not only on the economic resources and the health care available, but also on their ability or autonomy to make choices, to obtain knowledge and to use this as the basis for making informed choices for themselves and their family. 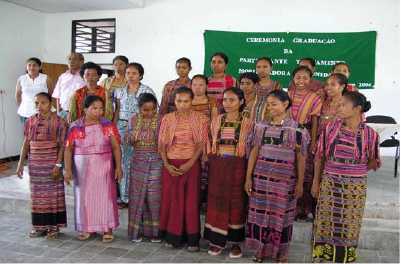 Women in Timor-Leste generally have a low status within the community. Despite the important role that women play they are usually excluded from decision-making and are often excluded from receiving information, advice and assistance. Establishing a network of trained women community mobilisers benefits the individual woman and her family. Through the participatory nature of her training it also enables her to become an important source of information and inspiration for the community. CMs must be volunteers and must have been selected by all segments of the community. They need to reside in the community where they will be working after their training. They must want to leave the village in order to undertake the training. This also means that their family must be willing to allow the women to go for the 3 month training. Since the women will be separated from their families for some time, it is essential that there are no pressing family concerns (like breast feeding or caring for elderly relatives). A large part of the training as CM focuses on increasing the self-confidence of the women. Their view on their role in society will change after they return from the training. They will be able to make informed decisions for their own situation and in the longer run assist the whole community. CMs are generalists not subject specialists. They are provided with a broad range of knowledge. Focus is on strengthening the capacity to apply/utilise practical knowledge and skills rather than the ability to simply repeat information without understanding its use or benefit. Long-term follow-up of CM is needed to ensure sustainability of the training that has been provided. 5. How to encourage women to become volunteer community mobilisers? Assisting women CM to develop income generating activities in the village (e.g. village shop, small agri-business etc.). Support in submitting a proposal to development or government organisation and programmes. Training of village leaders on and carrying out lobby work in order to gain a common understanding about participation in general and for women in particular. Highlighting the benefits to be derived by having a trained community mobiliser within the community. Explaining the procedures and expected outcomes of the community mobilisation process. The approach is that two women are selected from each targeted subvillage. Women who do not have any ongoing problems with the community or groups in their village. Prepared to stay in her village for the next 3 years upon to apply her new skills and knowledge for the benefit of the whole community. In order to ensure legitimacy and acceptance of the selection process and candidates, the village chiefs are expected to formally approve the candidates. Part of the empowerment process is that women have the time to discover themselves, to find out more about their peers and the environment in which they live in. Even something as basic as personal hygiene has proven to be an enlightening experience for the trainees. During the 3-month training programme noticeable changes took place: introverted, unsure women with poor personal hygiene have transformed themselves into more confident, outward going persons with much improved understanding and practice of personal hygiene needed for improving food security in the communities. They are less susceptible to family or community influences during the training process. Providing the participants with the opportunity to meet peers from other communities and establish friendships and networks. The training is divided into six subjects over a three-month period which included two field studies back in the community, the aim is to transmit knowledge and skills first at a family level and later at a wider community level. This approach of stressing practical aid was favoured in the context of the Timor Leste society as it was considered important that they received something tangible and readily applicable to the community. Group formation including team-building both in theory as well as in practice in the community. Community communication skills using participatory approaches (i.e. effectively listening and providing feedback). Good communication supports the development and motivation to raise new ideas in the community. Preventing several identified kinds of diseases (inter and intra family). Promotion of proper hygiene, potable water both within the household and within the community as a measure to prevent infections and disease spreading within the community. The training in team building, communication and community participation, the first three sessions, relies upon the women’s’ ability to share ideas and develop activities within the community addressing the needs of that community. It is envisaged that action may be implemented through informal networks and contact with their neighbours. The advantages of teaching practical subjects such as, nutrition and health, hygiene and sanitation and home gardening is that the women are able to apply this knowledge immediately and the benefits of participation in the programme are evident to the wider community. Training is undertaken by combining practical approaches with technical know-how. A sandwich course approach is practised which includes two field studies being undertaken in the home villages. After the training has been completed follow-up meetings and refresher courses ensure that the trainees have ample opportunities to enhance their skills and knowledge that they acquired during the basic training course. The subjects are taught in blocks and a core team (at least two people) are responsible for preparing and undertaking the lessons. The training includes at least two field studies during which the trainees have to complete special tasks back in their own villages. During the first field studies participants are expected to test and undertake village assessments. This include developing a calendar of seasonal food, usual types of sickness, local practice of breast-feeding, or special recipes for children. The tasks to be undertaken during the second filed study are formulated by each trainer. Trainees are prepared for the field studies by undertaking specific courses on assessment methods that they will practise during the field studies. In total the course last for 3 months. Training is undertaken from Monday to Friday (8.00-12.00 and 14.00-17.30). Each training unit lasts 1.5 hrs. The curricula comprises of 32,5 working days (i.e. 6,5 weeks). In addition to the six and an half weeks of classroom training the two field studies last an additional 5 weeks. Although a basic training curricula and training modules exists, these are not static documents but rather dynamic ones. They are being updated and revised on the basis of practical experiences and lesson learnt. After the three-month training course the women return to their communities. In their communities they are expected to make effective use of their newly acquired skills and apply these organically to other developmental activities in the community when the need arises. Since the women will not be able to undertake the work completely on their own, the approach envisages an intensive follow-up to keep up the motivation of women to push for changing their community. A proper follow up system is the most challenging aspect within the CM programme. (done during the last field study of the three-month training course). Monthly meetings/ gatherings and discussions are held together with the facilitator from NGO FSP to report on progress made. Incentives in kind are given twice a year, for example three different kinds of seeds for their home garden. After 6 months 2 further families are to be chosen. Once or twice a year the women will be invited to participate in a refresher training, which aims to revitalise their motivation to continue the work they have undertaken within their communities. The women are invited to suggest which subjects should be reviewed, and in which areas further training would be valuable. The refresher course is also an opportunity for the women to share their individual experiences back in their communities and share any problems they may be encountering. Given the benefits that can be derived from training women community mobilisers outside of their villages a need existed in the project area to find a suitable training institution willing to develop and conduct the CM training courses. The Natabora Agricultural School agreed to provide the CM courses. Agreement was also reached with the Ministry of Agriculture that the CM curriculum should be integral “extra-curricula” activity within the institutions education programme. Should be able to combine pedagogical staff from various institutions to conduct the CM training. This is necessary to broaden the topics that can be covered by the training institution as part of the CM curricula. For example, district health staff provide training to cover health and hygiene issues, while staff from the Agriculture School provides agricultural training and FSP staff can provide training on specific food security issues, etc. Development of the course curricula by a professional trainer with a view to offering the course not only in the project area but also as part of the Ministry of Agriculture training institute curricula. Establish a forum for other institutions to be able to participate in, learn from, or add to CM training process and the experiences that both the Natabora Agricultural School and the FSP project gain from implementing the CM training. Photo 5: There is nothing better than practising what one has learned! Taking into consideration the leadership role that the programme would like to infer to these women in terms of initiating change and development within the community, it is preferable that the CMs comply with a basic level of literacy and the role and opportunity for further education will serve to strengthen their self confidence and further empower them. Changes in attitudes and approach require an intensive dialogue to be undertaken within the community. This can be best achieved through the promotion of a network of Community Mobilisers who can support each other and apply their knowledge concerning: home gardening, traditional medicine, planning latrines and talking about nutrition and hygiene. The support from local village leaders and the family of CM makes the job for the women much easier, they become noticeably more effective in bringing new skills into the community. Support from those around them can also quash jealously from others in the community which undermines the confidence and effectiveness of the CMs and creates an environment in which their newly acquired skills are valued. A participatory training approach can be time consuming but it increases the intensity of the training and can be much more motivating, not only for the actual participants, but for the community at large. The consequence of this approach encourages women to share new techniques with other women and through them to the community as a whole, so that community mobilisation can be achieved through applied skills. The applications of certain techniques empower women within the community. Training and follow-up visits for the CMs necessitates establishing a district-wide network of Community Mobilisers who can be contacted by various other organisations for other developmental activities in the district. Communities noted that they feel that they have been effectively involved in the identification, planning and implementation of development activities. A better sense of ownership was noted and the communities reported that they feel the assets created are “theirs”. Capacity building should focus on all levels of society. The CM training aims to involve the heads of the villages, train women from remote areas and promote the continuance of the programme by training ever more individuals to spread the programme into these isolated, rural communities. FSP has been able to change attitudes and behaviour of community members away from the receiver-mentality towards greater self reliance. This is largely attributable to the community mobilisation process. Given that the country is a patriarchal system and women are not regarded as decision makers or even officially recognized by the leaders, perhaps only 30% of CMs will be active within the village, and then only if villages and suitable women candidates are targeted. It is recommendable to start with villages which are motivated to work with in community mobilizing process and later involve villages initially resistant to the programme. The forefront of any community interest in the project, even amongst the women themselves, is improving the food availability and generating income. Better educated women may take advantage of the training to improve the standards of child care and their status within the community; lesser educated women will need more time and more support. Training and coaching alone is not sufficient in order for the participants of the programme to become individuals who are able to drive/stimulate development within a village. There has to be certain “personal” drive and a willingness by the participants to take up the challenge. The number of people willing to become an active community mobiliser is therefore limited. The follow-up for the CMs in their communities is the most challenging aspect of the programme. Keeping the CM active requires a lot of effort on the part of the field worker. As more and more CMs are trained, more field facilitators are needed to do the follow-ups. CM has to change the reliance of the community on emergency aid encouraging them to be more self reliant. This takes time and patience. Avoid expectations that the CMs recruit many people to spread their knowledge and skills,their strength is their proximity to the community and their ability to hold informal talks with neighbours and targeted families. As always when dealing with individuals, it can be difficult to arrange a time to assess and measure the activity; on top of this is the women’s volunteer status which makes it difficult to impose a definite timeframe as to when a particular milestone must be reached. However, with encouragement, and a degree of good faith, these objectives can little by little be reached by the activities of the CMs within their communities. Donors or agencies which are willing to work in Timor Leste have to face the extremely limited human resource capabilities and professional working experience in the field of development and capacity building.